Even when the Land of the Midnight Sun feels more like the Land of the Noon Moon, there are celebrations to be had! Across Alaska and the Yukon, residents are throwing parties all winter long and some of these are not to be missed. Every year since 1984, sled dogs have raced 1,000 miles from Fairbanks, Alaska, to Whitehorse, Yukon, in the Yukon Quest. It’s an international sled dog race that follows the historic Klondike Gold Rush and mail delivery dog sled routes from the 20th century. The spirit of the race echoes the soul of the North. 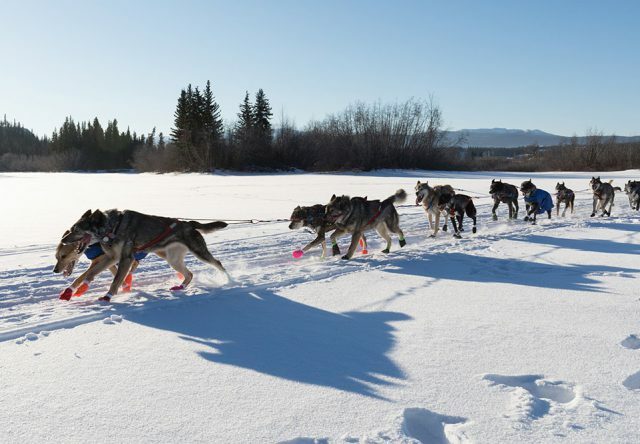 It honors the mushers and dog teams that cross frozen rivers, four mountain summits and endure the challenges of temperatures below 40 degrees Fahrenheit with winds up to 100 miles per hour. You can experience the spirit of the race firsthand at Westmark Fairbanks! Tickets are on sale now for the Start and Draw Banquet in the Gold Room at our Fairbanks Westmark Hotel. Or, stay at the Westmark Inn Dawson City to see racers come through the halfway point. We also love staying at Westmark Whitehorse Hotel and celebrating at QuestFest as the racers cross the finish line. If the Yukon Quest isn’t enough to get you to Whitehorse, maybe the annual Yukon Sourdough Rendezvous will be! It’s the largest winter festival in the Yukon and it’s been helping people beat cabin fever for 54 years. Come visit from Feb. 16-25 and experience it all. The full schedule of events includes Yukon’s Ultimate Lip Sync Battle, short performances in the Ice Wireless Performance Tent, Sweet Soul Burlesque workshops and performances, family-friendly Kidsfest events and so much more. If you like jazz or simply enjoy great live music, the Sitka Jazz Festival, Feb. 1-3, is a must-do. It’s an annual event that draws musicians from all over the country to headline performances every night for three days. This festival has been going strong for 23 years and in addition to drawing huge talent from across the country, students gather at the festival’s workshops to learn the technical skills, history and culture of jazz. You can get an all-festival pass and gain admission to concerts and workshops for only $40. Stay at the Westmark Sitka Hotel and never be far from the action. It might be cold and snowy, but Denali is not closed in the wintertime! If you’re planning a winter trip to Denali, we cannot recommend the dates Feb. 20-25 enough. It’s Denali Winterfest 2018 and there will be events and activities for all ages, interests and abilities. If you find yourself in Juneau during the last weekend of the month, Final Friday promises some of the best local food, entertainment, goods and services. It’s a great way to jump out of your tourist shoes and experience the town and its culture like a local. Check in for updates and start exploring! Wherever you find yourself this winter, you’re sure to find some fun to be had. So, bundle up and brave the cold, you won’t regret it!